Yet today's commercially available combs have a significant drawback. Because their tick marks are so finely spaced, the light output of these combs must be filtered to produce useful reference lines. This extra step adds complexity to the system and requires costly additional equipment. "We have demonstrated an alternative approach that is simple, reliable, and relatively inexpensive," says paper coauthor Kerry Vahala, the Ted and Ginger Jenkins Professor of Information Science and Technology and Applied Physics as well as the executive officer for Applied Physics and Materials Science in Caltech's Division of Engineering and Applied Science. The kind of frequency comb used by the researchers previously has been studied in the Vahala group in a different application, the generation of high-stability microwaves. "We believe members of the astronomical community could greatly benefit in their exoplanet hunting and characterization studies with this new laser frequency comb instrument," says Xu Yi, a graduate student in Vahala's lab and the lead author of a paper describing the work published in the January 27, 2016, issue of the journal Nature Communications. The new electro-optical comb that the Caltech team studied relies on microwave modulation of a continuous laser source, rather than a pulsed laser. It produces comb lines spaced by tens of gigahertz. These lines have from 10 to 100 times wider spacing than the tick marks of pulsed laser combs. To see how well a prototype would work in the field, the researchers took their comb to Mauna Kea in Hawaii. In September 2014, the instrument was tested at the NASA Infrared Telescope Facility (IRTF); in March 2015, it was tested with the Near Infrared Spectrometer on the W. M. Keck Observatory's Keck II telescope with the assistance of UCLA astronomer Mike Fitzgerald (BS '00) and UCLA graduate student Emily Martin, coauthors on the paper. The researchers found that their simplified comb (the entire electro-optical comb apparatus requires only half of the space available on a standard 19-inch instrumentation rack) provided steady calibration at room temperature for more than five days at IRTF. The comb also operated flawlessly during the second test—despite having been disassembled, stored for six months, and reassembled. 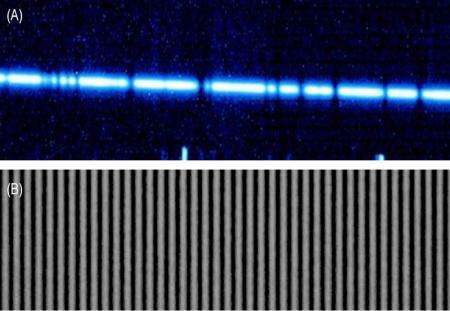 The Caltech comb produces spectral lines in the infrared, making it ideal for studying red dwarf stars, the most common stars in the Milky Way. Red dwarf stars are brightest in infrared wavelengths. Because red dwarfs are small, cool, and dim, planets orbiting these types of stars are easier to detect and analyze than those orbiting hotter sun-like stars. NASA's Kepler space observatory has shown that almost all red dwarf stars host planets in the range of one to four times the size of Earth, with up to 25 percent of these planets located in the temperate, or "habitable," zone around their host stars. Thus, many astronomers predict that red dwarfs provide the best chance for the first discovery of a world capable of supporting life. Other authors of the paper are Jiang Li, a visitor in applied physics and materials science, graduate students Peter Gao and Michael Bottom, and scientific research assistant Elise Furlan, all from Caltech; Stephanie Leifer, Jagmit Sandhu, Gautam Vasisht, and Pin Chen of JPL; Peter Plavchan (BS '01), formerly at Caltech and now a professor at Missouri State University; G. Ycas of NIST; Jonathan Gagne of the University of Montréal; and Greg Doppmann of the Keck Observatory.